Tessellation is a repeating pattern made of one or more shapes, without the formation of gaps or overlaps. An example is the periodic arrangement of hexagonal cells found in honeycombs. Tessellation can also be found at the molecular level, where single molecule units act as a tile (repeating pattern) to tessellate a surface through spontaneous and reversible interactions between them. It is challenging to build complex molecular tessellation involving more than one type of tile. Most research studies in the past decade have focused on tessellation using a specific tile type. A research team led by Prof Loh Kian Ping from the Department of Chemistry, NUS has demonstrated that highly complex periodic tessellation can be constructed from the tiling of two molecular phases that possess the same geometric symmetry but different packing densities. The two molecular phases, a high-density phase and a low-density phase, arise from the different intermolecular and molecule-substrate interactions. The high-density phase is formed by halogen bonds, while the low-density phase is formed via a halogen-gold coordination network. The geometric similarity between these two molecular phases allows the molecular units to serve as tiles to tessellate and form highly complex molecular tessellations. 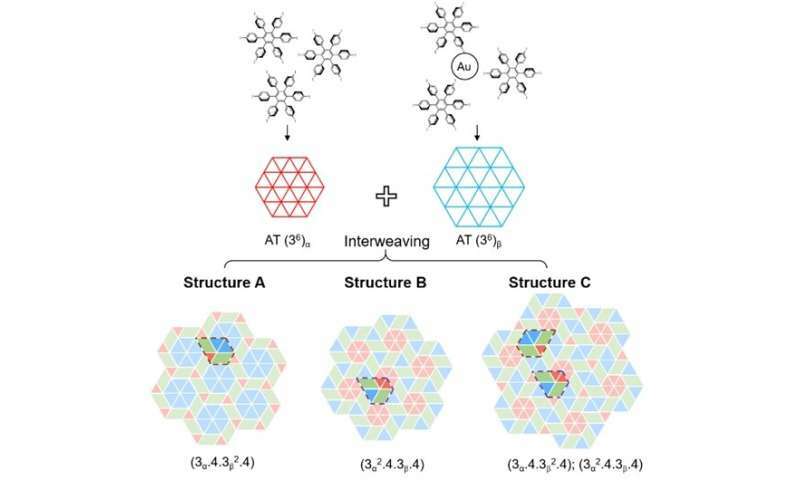 Prof Loh said, "By considering the symmetry of the molecular building blocks and substrate, as well as introducing multimode interactions, we can open up new routes to construct complex surface tessellations. This method can be potentially applied to other molecular systems with multiple types of intermolecular interactions to build even more complex architectures. In addition, the complex tessellations in this work may provide new insights for understanding self-organised systems in biology and nanotechnology." This work has been selected as an Editor's Highlight in Nature Communications.